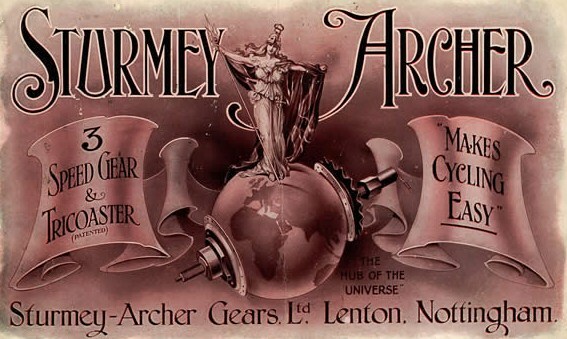 Henry Sturmey and James Archer teamed together in the early 1900's and commenced designing and producing bicycle and motor cycle components. 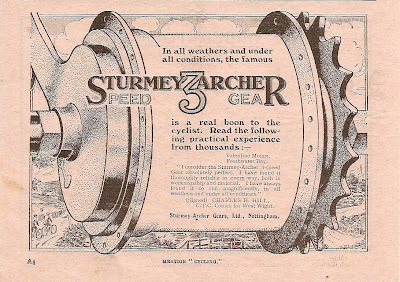 In 1902 they patented their first 3 speed hub. Their approach to cycle component design would become legendary throughout the 20th century as bicycle and motor cycle manufacturers adopted Sturmey Archer components as the basis for cycling innovation and design. 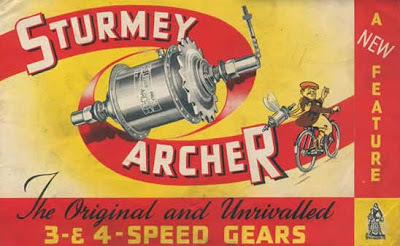 The history of the Sturmey Archer phenomenon is well documented at http://www.sturmey-archerheritage.com/ At this site you'll find some fantastic information on the Sturmey Archer story, with old catalogues and historical advertising material. 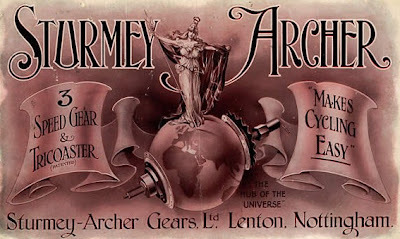 The catalogues are fantastic, and the advertising material even better. 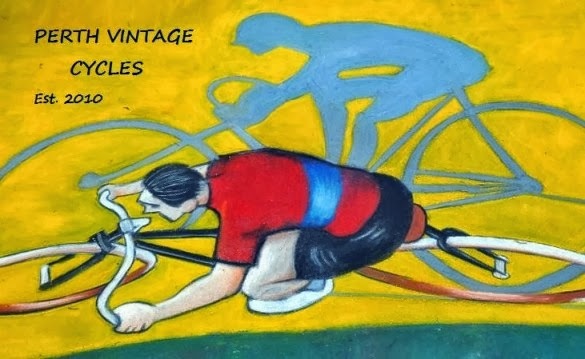 The advertising style captures the periods of the various products brilliantly. I have posted some advertising material below that captures some of these periods. I am a proud owner of a 2010 Pashley Guv'nor 3 speed bicycle that is geared by a Sturmey Archer X-RD3 rear hub with drum brake. 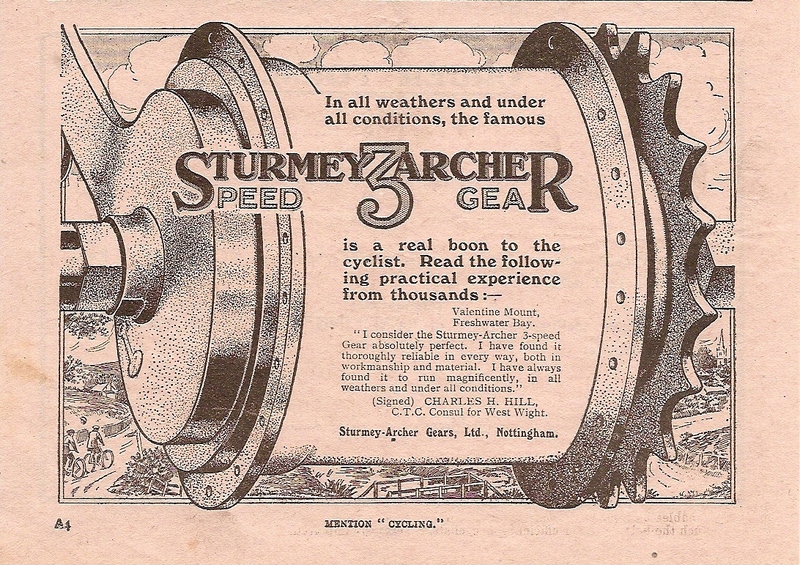 This equipment is faultless, an amazing piece of technology that is based on the Sturmey Archer patented 3 speed hub of 1902. 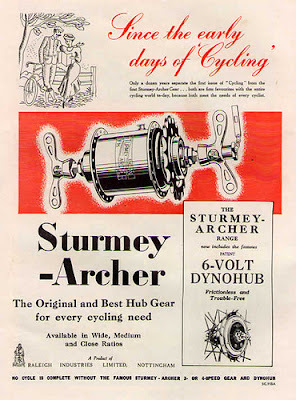 The Guv'nor also has a Sturmey Archer X-FD front hub with drum brake, this hub is also excellent.... and very stylish too. X-FD - front hub with drum brake and wing nuts to match. I have recently restored a 1974 AW 3 speed hub. Below are some before and after images of the hub that is in perfect working order. The old hub covered in oil and dirt. Reconditioned and polished.....almost like new! The beauty of these hubs is their longevity.....a generously oiled hub prevents corrosion and wear so make sure your hub is well cared for to ensure years of riding pleasure. Of recent interest is their new line of rear hubs....2 speed kick back, and combined fixed and free hub models with anodised colour choices.......just brilliant. YES, Sturmey Archer Hub Gear is one of the oldest Cycle gear maker company in Europe market. Thanks for sharing to described about it's history.